Listings have appeared on Manga Oh and Amazon Japan for a new book from Futabasha tentatively titled Sengoku Basara 4 & 4 Sumeragi Script Collection, scheduled for release in mid-September 2015 priced at ¥3,024 including taxes. It's been a while since the last script collection was released and this should make answering questions about the game's dialogue easier whenever it's necessary to check details without playing through the whole thing again. Hurrah. The Dengeki Online website is asking Sengoku Basara fans to think back over the last ten years and respond to a few questions for an upcoming book. Tentatively titled the Sengoku Basara 10th Anniversary Eiyuu Taizen: Kiwami ('Hero Encyclopaedia: Extreme'), it's scheduled for release in late October 2015 as a follow-up to the old Sengoku Basara 5th Anniversary Eiyuu Taizen. The book is going to include illustrations, CG artwork and setting materials relating to fifty characters from the series, as well as comments from KobaP and YamamotoD. Cast messages, interviews and commemorative autographs from the seiyuu will ensure there's plenty of content for fans to enjoy. The survey is quite quick, so even though it specifically mentions that it's supposed to be for Japanese fans I thought some overseas fans might also be interested in sharing their opinions. The questions are as follows. Q1. Which of the characters from Sengoku Basara is your favourite? Q2: Please tell us the reason you picked that character. If you picked the final option in the list ('other'), please also name the character you chose. Q3: Please tell us which scene from the Sengoku Basara series left the greatest impression on you. Q4: Please select two or three characters from the list below who you consider a famous team or rivalry from the Sengoku Basara series. Q5: Please provide the reason for the characters you chose in the previous question. If you picked the final option in the list ('other'), please also name the character(s) you chose. The final question asks for some simple demographic information, namely your Nickname, Email address, Gender (male, female), Age and Occupation (primary school student, middle school student, high school student, university student or graduate, preparatory school student or ronin, vocational school student, company worker or self-employed, part-time worker, unemployed, housewife, other). Respondents who live in Japan are entered into a draw to win one of ten ¥1,000 QUO cards, but as foreigners all we will have is the satisfaction of sharing our thoughts. Simple Japanese is best if possible since the best comments are going to be printed in the finished book! The deadline for participating in the survey is 4th September 2015. 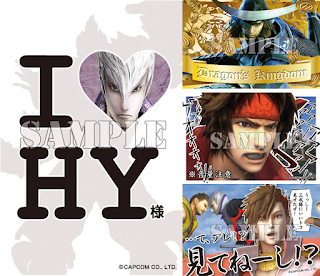 The summer Sengoku Basara collaboration event at Nikko Edomura (Edo Wonderland) is still running and Capcom's social media team have been highlighting four exclusive ¥300 stickers you can obtain when you visit the venue. The staff are hoping that the designs will make fans of the series grin knowingly. Several news sites have been covering a recent appearance by Nishimoto Yu-ki, the artist who created the stunning ink illustrations used for Giga Basara attacks in Sengoku Basara 4 and Sumeragi. Nishimoto's paintings are currently on display as part of the Sengoku Zukan -Cool Basara Style- ('Sengoku Reference Book -Cool Basara Style-) tie-in event at the Saitama Prefectural Museum of History and Folklore, and on 16th August he visited the museum in person to demonstrate live ink painting and talk about his work. The photographs in the Famitsu and 4Gamer reports give a good idea of what it must have been like to watch Nishimoto's dramatic performance. From what the reports describe, it sounds as though Nishimoto works quite quickly once he has decided how the finished artwork should look but some of the Sengoku Basara illustrations took quite a long time to visualise when he was working from scratch. It sounds as though it would have been a very interesting presentation to attend. Wednesday's special video was (Approximately) 10-second Theatre: The Three 'Bee's. Friday's new video was (Approximately) 10-second Theatre: Setouchi Conclusion. And yesterday's was (Approximately) 10-second Theatre: Solitude. Wednesday's upcoming video should be the last one in this series, so once that's available it's up to Capcom to inform us about any further promotion. I'm still hoping for some more DLC! I'm seeing that a lot of fans are anxious about the continuing wait for Ishikawa Chiaki's upcoming CD with the hauntingly beautiful Sengoku Basara 4 Sumeragi ending theme, Heavenly Blue. The preview trailer for the album might help in the meantime as you can also hear what the new versions of her older Sengoku Basara songs sound like towards the end. The sound problems are only in the PS3 version of the game. Most of the sound is fine, but there are certain clips which sound muffled, grainy or just plain strange. It's most noticeable during battle, so characters who talk a lot in combat (Kanetsugu/Musashi) and the new characters are affected. In addition, the sounds relating to performing a Giga Basara attack, transforming in the roulette, picking up an item and hitting an enemy are all affected. In Sengoku Basara 4, parrying an attack and nullifying an attack with certain special shield abilities made the same sound. In Sengoku Basara 4 Sumeragi, the normal parry sound effect is muffled while the noise which occurs in those other situations still sounds normal. Where it affects clips which were also used in the original Sengoku Basara 4, they sound worse than before - so people who have played the previous game are more likely to notice the problem. One fan commented that there were a few muffled lines in Sengoku Basara 4 with the lines which play right before the screen fades out after changing your settings in Sengoku Creation mode. This isn't a region locking issue as the same problem can be found on copies played on Japanese PS3s while logged into a Japanese PSN account. I was sent a link to an Amazon review which described the exact same symptoms. So far, most people mentioned having the physical disc version of the game so I'm not sure whether the PSN download version is similarly affected. Edit: It's been confirmed that the problem also exists in the downloaded version of the game. All of the feedback has convinced me that it's a widespread problem given that there are relatively few importers yet many have noticed the issue. It affects all of the PS3 copies but the individual speaker setup probably affects how noticeable it is. The good news is that the PS4 version seems fine, so presumably there are no problems with the original game assets. One of the people who contacted me said that someone has asked Capcom for assistance already, so I checked and they have posted a FAQ on their support site which acknowledges the problem and states that they had to reduce the audio quality for PS3 due to memory limitations. That seems a bit weak so I might send them a list of these complaints too so they realise that they need to do something about it. If you want to complain, please use this link then press the red button to access the form. Pick the top option in the list ('glitch') then the fourth checkbox ('other'), then 'PlayStation 3', then the top option if you bought the game new on disc (if you bought it from PSN, it's the third option). Next comes the game title (it makes no difference so you can just write 戦国BASARA4 皇 通常版 BLJM-61248) and date of purchase. Pick the first three options to confirm that it happens every time then skip the small text box as there is no error code. The huge text box is for describing the problem, so go ahead and do that. They will only respond in Japanese but they will probably read English complaints as well (or you can just post the link to the Amazon review and say something simple like "bad audio like this!"). Pick the second option at the bottom of the text box, as the top one is for people with a damaged disc. Finally, add your personal details. The first four boxes are for your name in kanji then kana, then it asks for your age. You can skip everything else other than the boxes for your email address at the bottom. Capcom will probably just apologise and say there is nothing they can do, but they're advertising the game as having good quality sound so I think it's fine to complain if you're not happy with the muffled audio. Even if they really did have to compress the sound more for the PS3, it's clearly being compressed too much if it's disrupting the game for a number of users. Good luck! Thanks for the link to the survey. Had a hard time choosing between Kenshin and Kasuga but in the end decided to go for Kenshin. Sure he's less popular but hey if enough people say they like him who knows what could happen. Naturally chose them for the best team, and decided to choose Kasuga's drama ending in Sumeragi as my favorite. Was gonna be either that, one of the times Kenshin saved her (anime or Sumeragi), or one of their endings in 2... Hehe. Makes me hope Kasuga has a chance to actually save Kenshin sometime, though, (not counting the manga when she carries him from the battlefield, as that was more transporting him, and Kenshin saves her in Roar of Dragon I believe so...~). If they're going to have art for all the characters in the poll, I'll definitely have to pick the new book up! Might get the script too. My Japanese is horribly shoddy but it'll be nice to have for when I'm better at it. Regarding the sound "bug".... Just played Sen no Rikyuu again today and realized he was the one who had muffled sounds. I'm guessing in the PS3 version any of the new in-battle recordings they did just for Sumeragi rather than 4 in general might have been downsized from a recording primed for PS4 play which caused this problem. It would be great if Capcom patches it, but I doubt it. Thankfully I'm not too attached to him so it doesn't give me much cause for complaint but it's still there. It will be great if they can get fan comments for all of the characters in the whole book! I'm hoping the shipping won't cost a lot as the 5th anniversary version was a huge book! Do you remember in which chapter kasuga carries kenshin ? Oh! Hello! Um, I sadly don't. I sure wish I did! I do recall it being in the Sengoku Basara 2 manga which has been localized in English as Sengoku Basara Samurai Legends. Naturally chose Keiji as my favourite, but I chose Masamune and Yukimura as my duo beacuse I just can't imagine the series without them. Their dynamic is so simple but works too damn well for me to choose anyone else. They're pretty much the perfect rivalry in my eyes, and I was really choosing between them, Shingen and Kenshin, or Keiji-Toshiie-Matsu. Good choices! Keiji is a sweetie, I can't wait to read all of the fan messages in the final book. That was a difficult survey! In the end I decided that I liked the weird yet awesome version of Sen no Rikyuu, that every time Sourin and Motonari appeared singing "Xavixavixavixaviixa!" makes me laugh hard, and that I see Muneshige and Yoshihiro as a great thunder-wielding, cool-old pair with great potential for interesting stories (I always have loved that legend of the historical versions of both in which although Yoshihiro killed Muneshige's father, when fleeing from Tokugawa troops after Sekigahara Battle, Yoshihiro gave Muneshige the opportunity of avenging his father, but Muneshige replied that it's a shame for a samurai to beat a injured opponent -In Sekigahara, Shimazu troops suffered great damage-, and instead, helped him and his men to flee, much to Yoshihiro's surprise. After that, Muneshige and Yoshihiro paid equal respect to each other and tried to help each other in difficult times). I really would to see that story in Sengoku BASARA! It's a shame you mus pick only 1 favorite character and 1 team, I would like to have talked about other of my favorite characters (Yukimura, Keiji, Magoichi, Motochika, Yoshitsugu, Nobunaga, Sakon... I love the pair of Keiji-Magoichi, Yukimura-Masamune, and Tenkai-Hideaki as well). PD: Excuse me if my English here was weird, I think this is the first time I wrote such a long and complex response! Now that everyone has been introduced properly I hope they can expand on more of the character relationships some of the less popular warriors experienced in earlier games. I think it would really help Yoshihiro if a (future) new character appeared with a strong link to him, to give him a reason to be part of the main plot. Muneshige gets a lot of chances to appear but he's mostly used as a joke - poor guy! The two of them were scary the first time I played that Sekigahara stage in Sengoku Basara 3 with both of them fighting together. I want to see more scenes with them being awesome again. Thanks, I'm glad for that then. "The Two Western Thunder Warrior's Meeting: Escape to Kyuushuu from the East Sun Thunder"
Commanders: Tachibana Muneshige, Shimazu Yoshihiro. Subcommanders: Ootomo Sourin, Miyamoto Musashi (Yes, that Musashi), Ii Naotora, Honda Tadakatsu. Description: After the Battle of Sekigahara, Shimazu and Tachibana troops, separated, are fleeing from Tokugawa Army, and just before taking a ship to Kyuushuu, Yoshihiro and Muneshige meet each other in a port, and decide to help each other instead of fighting. Sourin and Musashi arrives to help them, but Tadakatsu and Naotora are pursuing Shimazu and Tachibana troops! *This stage is a portual town with resembles a little to a maze. *Naotora has lost the way to Yoshihiro and Muneshige, and she is running in a kind of maze straight to a trap made by Sourin and Musashi. When you take a base, a gate will close and Naotora is forced to take another route... although she won`t reach Muneshige and Yoshihiro. *Tadakatsu arrives a little bit late, but he is fast enough and he's running to Muneshige and Yoshihiro. He will use other paths, try to locate him! Take all bases before Naotora arrives to the trap and gets captured, if you do that, Naotora will arrive to Sourin and Musashi who will try to stop her, and you will be fighting this strange trio. If you don't, Naotora will get captured (you won't be fighting her), and you have to fight only Sourin and Musashi. Defeat Tadakatsu before he arrives to Yoshihiro and Muneshige. If you don't, you will be fighting the powerful three thunder-wielding warriors at the same time! I wish I could go to a live performance. It must be beautiful. Looks like holding off from the PS3 version of Sumeragi saved me a bit of grief. I just hope they put out a "best" version of the PS4 game by the time I actually get one, lol. EDIT: I can't help but love Yukimura the most. I do genuinely enjoy most of the SenBasa characters, but he's still my fave after all these years. I know there are some people who dislike specific characters for a variety of reasons, but I'm the type who loves (just about) everyone too and have a few special favourites amongst the group. Yukimura isn't the highest on my personal list but he's such a great person throughout the series that I can certainly understand why so many people adore him. I've really enjoyed seeing him having a more fun time again in Sengoku Basara 4 and its sequel, and getting to be involved in lots of memorable moments! Yukimura is really my favorite one, along with Keiji, Nobunaga, Sakon, Muneshige, Sourin, Yoshitsugu, Magoichi, Sen no Rikyuu and Motochika.